This programme takes place at Marymount in Kingston-upon-Thames where we also run a residential programme. The campus is located on a private residential estate and is ideal for young learners. It is safe, compact and has many great facilities, all set in beautiful landscaped lawns and gardens. Classrooms are modern and well-equipped. Good use is made of the IT facilities in the school library. 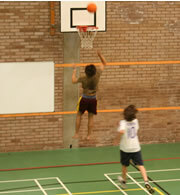 The multi-purpose sports hall caters for a wide variety of sports including basketball, volleyball and badminton. Outdoors, there is a 5-a-side football pitch, a tennis court and lawns for other games. There is also a FabLab, an art studio and a spacious auditorium where end of week presentations take place. A private coach, accompanied by our staff, collects children from a pick-up/drop-off point near Gloucester Road Underground Station, Kensington and takes them to the school. The coach leaves promptly at 08:30h and returns by 18:00h, Monday to Friday. The journey takes just over 30 minutes, depending on traffic. On Friday afternoons parents are invited to attend the end the end-of-week presentations. *Full Day course is from 8:30am-6:00pm, Monday-Friday. Private coach service is included in the fees, please contact us with any questions. "I'm really looking forward to meeting you at Marymount this summer. I'm sure we're going to have a wonderful time together and will take home lots of happy memories."